Single Light Beam Safety Devices that provide the most universal coverage possible for the most important requirements at point of operation and access guarding must combine the most diverse device features. The SLS 96 series was conceived to provide the design engineer with optimum integration and application in wide-ranging industrial use. The designer now has the choice between a robust metal housing with glass cover and a solid plastic housing, both with IP 67 protection rating. Furthermore they can also choose whether the connection is to be via M12 plug or via a terminal chamber. Red light and infrared light variants enable fault-free parallel operation of adjacent Light Beam Devices. The extensive range of accessories for this Light Beam Device rounds off the exceptional features of this series. Together with a test monitoring such as TNT 35 or an MSI Safety Interface, for example, the SLS 96 forms a type 2 active opto-electronic protective device. 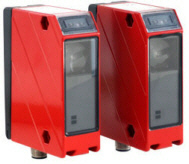 Purchase your Leuze SLS 96 Single Light Beam Safety Devices today!